Paarl Rocks hold the edge over Tshwane Spartans due to the balance in their squad. The Tshwane Spartans have been underperforming throughout the tournament with only two wins in the four matches they played thus far. They are placed at No.5 in the points table at the moment and their chances of making it to the next stage look difficult. The AB de Villiers-led team hasn’t had luck going their way as they lost two matches by DLS method and one of it was one by a whisker. The return of Eoin Morgan and Rilee Rossouw will give a boost to the struggling Spartans. In the crucial game on Wednesday, the Spartans will be up against Paarl Rocks who have peaked lately. 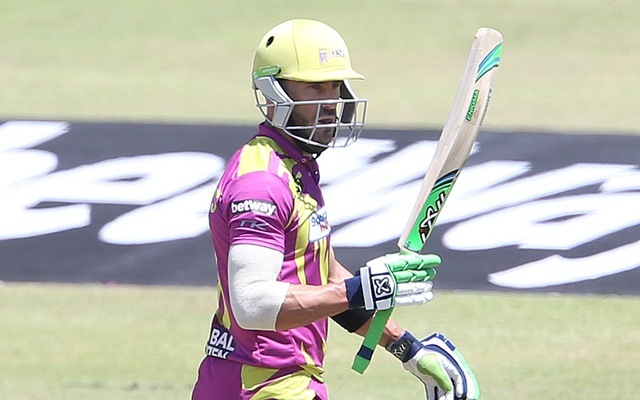 After starting their campaign with consecutive losses, the Paarl team won three of their next four matches under Faf du Plessis and gained a bonus point as well. They will be hoping to strengthen their chances of a top-three finish by winning the reverse fixture. The Paarl team started with a one-run loss chasing a 200+ target against Tshwane. The 21st match of the Mzansi Super League will be played between Tshwane Spartans and Paarl Rocks at the SuperSport Park in Centurion. The match starts at 2:00 PM local time (12:00 PM GMT) (5:30 PM IST). The last two games at the SuperSport Park witnessed scores of 170+ for batting first side. The hosts, Spartans, who were the chasing team on both occasions, won while in pursuit of a 180+ target and lost by a huge margin chasing 170. The venue, aided by its short side boundaries, is expected to produce another high-scoring game with the team batting second having an edge. AB de Villiers (C), Eoin Morgan, Lungi Ngidi, Robbie Frylinck, Jeevan Mendis, Theunis de Bruyn, Rory Kleinveldt, Sean Williams, Gihahn Cloete, Lutho Sipamla, Tony de Zorzi, Dean Elgar, Andrew Birch, Sikandar Raza, Shaun von Berg, Rilee Rossouw, Eldred Hawken. Faf du Plessis (C), Paul Stirling, Dwayne Bravo, Tabraiz Shamsi, Dane Paterson, Aiden Markram, Mangaliso Mosehle, Bjorn Fortuin, Vaughn van Jaarsveld, Grant Thomson, Michael Klinger, Tshepo Moreki, Henry Davids, David Wiese, Eathan Bosch, Patrick Kruger, Kerwin Mungroo, Cameron Delport. AB de Villiers (C), Gihahn Cloete (WK), Dean Elgar, Theunis de Bruyn, Eoin Morgan/Rilee Rossouw, Sikandar Raza, Robbie Frylinck, Sean Williams, Jeevan Mendis, Rory Kleinveldt, Lutho Sipamla. Faf du Plessis (C), Paul Stirling, Aiden Markram, Henry Davids, Cameron Delport, Mangaliso Mosehle, David Wiese, Dwayne Bravo, Dane Paterson, Bjorn Fortuin, Tabraiz Shamsi. Cameron Delport and Dwayne Bravo played a crucial role in the Paarl’s maiden game of the tournament which they lost by one-run. The duo will be joining the team along with Paul Stirling who is returning from the T10 League. Mangaliso Mosehle, AB de Villiers, Faf du Plessis, Henry Davids, Dean Elgar, David Wiese, Sikandar Raza, Sean Williams, Dane Paterson, Bjorn Fortuin, Lutho Sipamla. One of Faf du Plessis and Henry Davids can be considered as captain and the other becomes your vice-captain, Dean Elgar and David Wiese can be the other set of players fitting the multiplier options. Given the way AB de Villiers has performed in the previous four games, one can take the risk by keeping him out of their fantasy XI. However, the Tshwane skipper might come out all guns blazing in the crucial game for his team. Get the latest Cricket News and updates from Mzansi Super League, Match Predictions, Fantasy Cricket Tips and lots more on CricTracker.com.